The Surgery Department at Summerlin Hospital Medical Center provides an experienced staff and new tools and techniques for both inpatient and outpatient surgical procedures. The department includes ten surgery suites, a recovery room, a self-contained endoscopy center and more. Many procedures can be done using minimally invasive techniques. This type of surgery may lead to faster healing and less scarring. 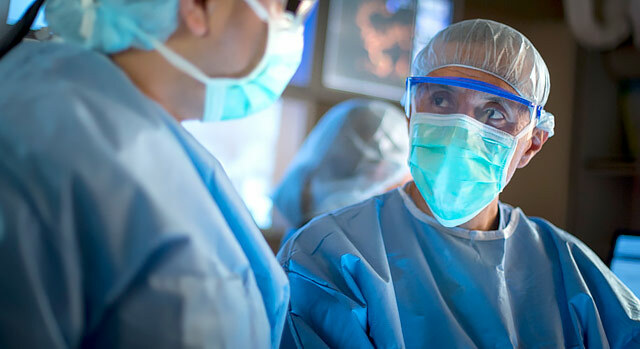 Using advanced technology, surgeons make small small incisions in the body and use video equipment to provide a magnified view of the surgical site. Instruments are used to perform the surgery through the incisions. This can result in smaller scars, less time in the hospital and a faster recovery. Surgeons at Summerlin Hospital use the da Vinci® Surgical System, an advanced robotic platform that allows doctors to perform complex procedures using smaller incisions than standard surgery with small tools operated robotically. This may result in less pain, scarring, trauma and blood loss than other surgical procedures so that people can potentially return to work and daily activities more quickly.